This " Space Paper / Backgrounds Clipart " set has 28 images - 14 different images in both color and black & white. The images are high resolution – 300 dpi - so you can enlarge them and they will still be crisp – great for using in your teaching products or as printables. The space backgrounds include different types and quantities of stars, along with 2 backgrounds that include Earth, and 1 background on the Earth looking up at the stars. All images are in png format so they can easily be layered in your projects and lesson materials. All designs and images are the creative property of Kriss Pettersen and should not be redistributed unless incorporated and secured in a new original design/product. 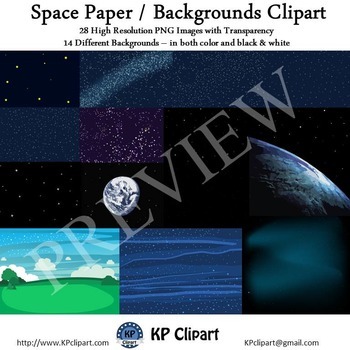 Designs and images from KPclipart cannot be used to create new clipart. Images cannot be resold or used to promote other clipart artists or clipart products. If you have any questions please feel free to e-mail me at kpclipart@gmail.com.